Following the wonderful Brian Wilson: Songwriter 1962-1969 documentary that came out in 2010, MVD has followed it up with another gem, continuing the story of Brian Wilson, one of the most important, talented and popular musicians of the past century. My love of the Beach Boys is unequaled and any documentary about them becomes an instant must for me. 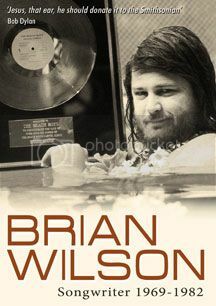 Coming Octobert 23rd, is Brian Wilson: Songwriter 1969-1982. Most people know of The Beach Boys from their surfing hits and Brian Wilson as being the genius behind Pet Sounds. So what happened to Brian Wilson after that? This documentary shows Brian during his darkest period when he was struggling with drugs, depression and commercial failure. We see an album by album history from this time period and learn how Brian's involvement wavered between records. We also learn about the infamous Eugene Landy, Brian's therapist who turned out to be as much a blessing as a curse for Mr. Wilson. But mainly we learn about the music and how some of the Beach Boys' most interesting and underrated albums came to be. Being a Brian Wilson fanatic, this documentary is a dream come true. We get behind the scenes stories from fellow Beach Boys (Bruce Johnston), critics, managers and musicians about the music of the time and what went on behind the scenes. Some of my favorite Beach Boys albums are discussed (Friends, Carl and the Passions "So Tough") which is a plus. The doc even got me to really listen to Brian's misunderstood masterpiece The Beach Boys Love You, which has now become one of my favorite Beach Boys albums. This disc is very informative, moves along well and at a whopping 2 hours and 15 minutes leaves no stone unturned. Just great stuff and I hope MVD puts out another doc covering the remainder of the Beach Boys' career.